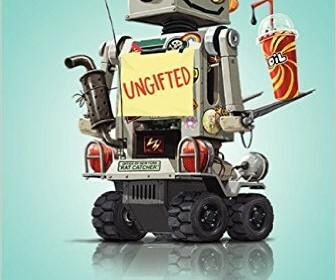 Gordon Korman’s “Ungifted” is a story about a young boy who escapes danger in the weirdest way. The word gifted has never applied to Donovan Curtis, more like below average and don’t try this at home. Donovan is tall, dumb, and street smart. His friend Noah Youkilis is short, a super genius and socially awkward. The book starts at Hardcastle Middle school and moves to the Academy for Scholastic Distinction. Hardcastle is poor, drab, and gray while the academy is well funded, clean, and sparkly. Hardcastle can barely afford state standards and the Academy can afford top form labs and the best parts for robotics. The book is about Donovan Curtis who after sneaking out of detention accidentally knocks over a giant statue in front of the school. He gets caught and the superintendent writes his name down for expulsion, But he accidentally writes it down on the list for children going to the Academy for Scholastic Distinction. Donovan takes advantage of this and hides out at the school. He soon realizes that the students at the academy are way out of his league. Classes like robotics and advanced calculus baffle him. Donovan has to learn advanced subjects while laying low and trying not to be found by the superintendent. I would definitely recommend this book to others. It is funny, suspenseful, and interesting. The characters aren’t boring and the characters personalities aren’t revealed until near the end of the book. I really enjoy Gordon Korman’s writing style. In many of his books he switches between characters so you can see everyones view on problems. This also helps because he writes in a different way for each chapter so if someone didn’t understand something in one chapter the next one might explain it better for them. This book is realistic fiction. The message is to not pretend to be someone you’re not because things can go wrong.